These days virtually anything you need can be purchased through a subscription, with more convenience than ever before. Far beyond Spotify, Netflix, and New York Times subscriptions, you can sign up for weekly or monthly supplies of everything from groceries (AmazonFresh) to cosmetics (Birchbox) to razor blades (Dollar Shave Club). Consider Whatsapp, the internet-based messaging service that was purchased by Facebook for $19 billion. While other services bombarded users with invasive ads in order to fund a free messaging platform, Whatsapp offered a refreshingly private tool on a subscription platform, charging just $1 per year. Their business model enabled the kind of service that customers wanted and ensured automatic customers for years to come. As Warrillow shows, subscriptions aren’t limited to technology or media businesses. Companies in nearly any industry, from start-ups to the Fortune 500, from home contractors to florists, can build subscriptions into their business. • The Membership Website Model: Companies like The Wood Whisperer Guild, ContractorSelling, and DanceStudioOwner offer access to highly specialized, high quality information, recognizing that people will pay for good content. This model can work for any business with a tightly defined niche market and insider information. • The Simplifier Model: Companies like Mosquito Squad (pest control) and Hassle Free Homes (home maintenance) take a recurring task off your to-do list. Any business serving busy consumers can adopt this model not only to create a recurring revenue stream, but also to take advantage of the opportunity to cross-sell or bundle their services. • The Surprise Box Model: Companies like BarkBox (dog treats) and Standard Cocoa (craft chocolate) send their subscribers curated packages of goodies each month. If you can handle the logistics of shipping, giving customers joy in something new can translate to sales on your larger e-commerce site. This book also shows you how to master the psychology of selling subscriptions and how to reduce churn and provides a road map for the essential statistics you need to measure the health of your subscription business. 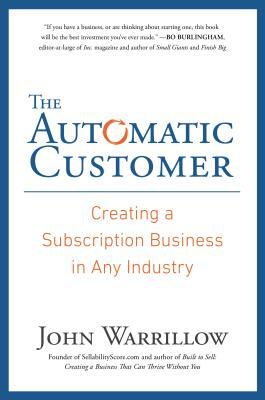 Whether you want to transform your entire business into a recurring revenue engine or just pick up an extra 5 percent of sales growth, The Automatic Customer will be your secret weapon. JOHN WARRILLOW, the author of Built to Sell, is the founder of a subscription-based company called The Value Builder System™, where advisers help company owners increase the value of their businesses. Before that he founded Warrillow & Co., a subscription-based research business dedicated to helping Fortune 500 companies market to small business owners. A sought-after speaker and popular Inc.com columnist, he lives in Toronto, Canada.